Jamila fled Syria with her two children after she learned her husband’s body had been dumped in a field. When she arrived in Lebanon, the 36-year-old single mother fell behind in her rent. She was also threatened by anonymous phone calls. “What can I do? Where can I go for protection?” Jamila says. Thirty-four-year old Yasmina lives in a former storeroom with her husband and two small daughters, one of whom has a heart problem. Their home has no windows or plumbing and the family is having trouble surviving. Razan’s husband returned to Syria for medical treatment two years ago and disappeared. She is a single mother with four young children. Razan was evicted from one apartment and abused by another landlord until Caritas Lebanon social workers stepped in and found her shelter. These are some of the heartbreaking stories that emerged from a recent study by Caritas Lebanon. The study found thousands of refugees in Lebanon are facing a housing crisis driven by extreme poverty, spiraling rental costs and poor legal protection. Conducted by the Caritas Lebanon Migrants Centre (CLMC), the findings showed a majority of Syrian refugee households were living below the poverty line and many refugees were highly vulnerable to exploitation and eviction across the country. “While Lebanon struggles to accommodate over more than one million registered Syrian refugees, we must constantly be reminded that every person deserves a home to preserve his or her family’s dignity and safety,” said Fr. Paul Karam, president of Caritas Lebanon. The CLMC interviewed 288 Syrian refugee families in Beirut, Tripoli, and Saida for the study. It found refugee households paid an average $291 in rent and were forced to spend an average three-quarters (76%) of their total income on rental. “A primary concern for Syrian refugees everywhere is shelter, but this challenge has been compounded in Lebanon by the lack of formal refugee camps and the country’s notoriously expensive real estate,” the study concluded. The CLMC study found two-thirds of Syrian families (66%) are more than two months behind in their rental payments in Lebanon and more than a third (37%) are without a legal residency permit. While 67% said relations with their landlords were fair and friendly, many are vulnerable to exploitation and forced to live in overcrowded conditions. One in five Syrian families have been threatened with eviction. The Syrian refugee crisis has surpassed the international community’s worst expectations. Of the 4 million Syrian refugees now living throughout the Middle East, Lebanon hosts more than a quarter of the total number of Syrians who have fled their country. The influx has provoked social tension in Lebanon and put pressure on water, electricity and other services. The UNHCR estimates 1.5 million Lebanese are living below the poverty line and 336,000 are in need of humanitarian assistance as Syrian refugee households wait for effective solutions and adequate public policies. 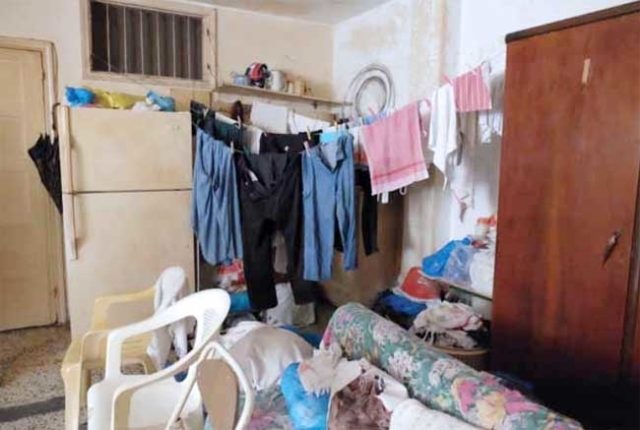 Caritas Lebanon is urging the government to give refugees adequate legal protection from unscrupulous landlords and greater support to help ease the suffering of thousands of families. But is also looking abroad for more assistance for those in need. “We call on the international community to support Lebanon in facing the enormous burden of hosting large numbers of refugees on behalf of the rest of the world,” said Fr. Karam. Caritas Lebanon has been supporting refugees since the early days of the Syrian conflict. The CLMC is the leading service provider for refugees and migrants in Lebanon with a team of 300 professionals. Five years into the Syrian crisis, it has assisted more than 330,000 refugees with food aid, housing, education, legal aid and medical and psychological support.